TechRadar has pulled together the first screenshots of Google Chrome OS, from the application menu to the in-browser chess. In truth, the concept of Chrome OS will confuse many, being a major step away from the traditional concept of the operating system. Chrome OS is, at heart, a browser with some key additions and it is far from a direct competitor for Microsoft's Windows just yet. The applications panel. A key part of the Chrome OS is the applications panel - the thing most comparable to a traditional desktop or start bar. This is where apps will be launched from - including Gmail, Google Docs and Calendar. As you can see from the shot - the look and feel is still that of a browser, with tabs etc. The applications panel is launched from an icon in the top left of the screen. Multiple sessions: Google insisted that this part of the user interface (UI) would change, but this indicates how a user can have multiple groups of tasks (essentially multiple browsers) running at the same time so that a user can shuttle between them. Native music support:Native music and video support is key to Chrome - as you may expect. Clicking on a music link in Google's new Google music search integration brings up a player and off we go. Panels: Panels are key to Chrome OS. Chat, music, notepad and other apps can all run in panels - just like the familiar Google Chat pop up in Gmail. Browser: As you can see - when you are surfing, the OS looks exactly like the Chrome browser. As Sundar Pichai, Vice President of Product Management, told the conference "Chrome IS Chrome OS". 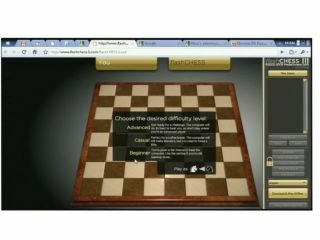 Chess in Chrome OS: Chess was one of the applications shown running in Chrome OS - it runs either in a tab or full screen. As Google points out: "Any web app is a Chrome OS app". Documents: Obviously the way in which files are handled is a key factor - and Chrome OS simply translates the familiar trees into a browser tab. Books: Google made special mention of the way in which books in Google Books render. Will Chrome OS Devices be looking to take on eReaders?